Beauty and grace. At times it seemed my Kansas childhood was entirely devoid of those two things. I was the seventh of eight kids, scrawny, socially awkward, un-pretty, a ballet person amid a culture that revered team sports, school sports and cheerleaders. In truth, I didn’t even know I was a ballet person, but at age ten I insisted to my parents that I really, really needed to try a ballet class. They finally agreed. Ballet taught me I could be good at something. None of my sociable, academic-achieving siblings had taken dance; it was my thing alone. I liked that. I needed that. The classes took place in a retail area walking distance from home, a basement studio with a concrete bracing post in the middle of the main room and scuffed linoleum floors. My teacher had never been a professional or even pre-professional dancer, nor would any of the kids around me develop into real dancers, but I found grace there. Beauty. In my teacher’s face, her regal presentation as she demonstrated the adagio to the band of little girls with poor turnout, stiff arms and ill-fitting ballet shoes. She and the music were beauty. And when I moved in that way, to that music, I became beautiful. Full of grace. If only for an hour. In college, a miracle. I finally began to see beauty and grace in my mirrored reflection; the ugly duckling getting her swan moment at last. It was as if ballet had done the transforming. I found a tribe of like-minded people and was invited to join the local company. Here, ballet taught me its next lesson: about being a real performer. Sure, still the beauty and grace, always. But now ballet toughened me up. I worked hours each day at the craft. I sweated and pushed and fought for the chance to perform onstage. Ballet taught me to reach for the stars, to accept the work, the price, to paste a smile on my face and dance for the audience no matter how I was feeling. A devastating break-up hours before opening night. An overtaxing season as Sugar Plum Fairy, performing nightly with an infected open blister on my big toe that became agony every time I went en pointe. The spring performance when I stretched back on the overhead lift and my unitard costume didn’t, exposing one big, round breast, providing more entertainment than I’d intended. The less-than-ideal performance venues: an elementary school gym, a Wal-Mart grand opening, a too-breezy outdoor stage. Little matter; I was dancing, performing, and that meant everything. That was thirty years ago. I’ve left ballet and come back, left and come back, left Kansas (and not come back). Life has treated me well, but not without the kind of bumps and scratches we all accrue. Which can wear on a person after a while. The other night I arrived for my weekly ballet class in a particularly tired, depleted state. The instant that music began to play for pliés, however, a gorgeous Chopin nocturne, beauty and grace slipped right back into the equation. It permeated me, filled me up, nourished me, just as it had for that lonely adolescent. And with it, a lovely reminder: these things were forever accessible to me. Maybe not every single time, not at my command. But I need only show up, keep ballet relevant and alive in my life, and invite them in. They would do the rest. 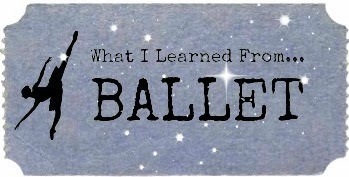 Oh, the things ballet can teach a person. Terez Mertes (who also publishes as Terez Rose) once lived for ballet alone, but is now a mom, blogger and writer who makes her home in the Santa Cruz Mountains. Her stories, essays and reviews have appeared in the Philadelphia Inquirer, Milwaukee Journal-Sentinel, Crab Orchard Review, Mid-American Review, MostlyFiction, Dance Advantage and numerous anthologies. She blogs about the arts as The Classical Girl at www.theclassicalgirl.com and reviews ballet performances for Bachtrack.com. She’d love to follow you back on Twitter as @classicalgrrl. Terez, this is really a wonderful piece. Thank you for sharing your story and why we cannot underestimate ballet's ability to shape lives for the better. Thank you for your nice comment, Jenn, and thanks so much for giving me the chance to offer my two cents' worth here. Proud to be a contributor to this lovely, thoughtful site of yours! Terez, this was a great post! I so enjoyed it, as I can totally relate to your childhood. Dancing really does make those long, tiring days better, doesn't it?